We completed the Pacific Crossing! Bertrand Piccard just pushed through the night sky, gently kissing the runway with a smooth landing at Moffett Airfield, California. The transition from the gentle wonders of the sky to the shared elation of landing was quick. He descended from the cockpit where he had been sitting for the past 62 hours and greeted his solar brother, André Borschberg. He had been waiting for Bertrand at Moffett Airfield since Friday afternoon, making final preparations on the ground before his arrival. At 4:15PM UTC, 6:15PM CET, 6:15AM PT on April 21st, Bertrand took off from Kalaeloa Airport, Hawaii to complete the Pacific Crossing. Destination: Moffett Airfield, Mountain View, California, USA. André initiated the Pacific Crossing last July with a flight from Nagoya to Hawaii that lasted 117 hours and 52 minutes. After 9 months in the Kalaeloa hangar and as soon as the days were long enough to fly with Si2, the Solar Impulse pilots decided to resume their quest to conquer the full circumference of the earth in a solar-powered airplane - from Abu Dhabi to Abu Dhabi. By the time our pilot, Bertrand Piccard, got used to his tiny 3.8 meter cockpit, he had already reached Moffett Airfield and had no choice but to land. Jokingly, he told the CAPCOM, “I could continue all the way to New York!” He touched down on the Moffett Airfield runway 62 hours after takeoff at 6:44AM UTC, 8:44AM CET on April 24th, and 11:44PM PT on April 23rd. 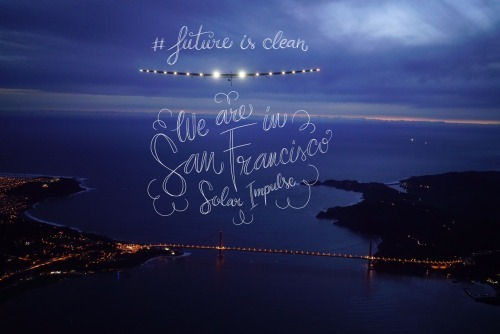 The Solar Impulse team could not have asked for a better window to complete the Pacific Crossing solar flight. They were teased at the start with a slight takeoff delay due to windy conditions on the runway, however the rest of the flight followed smoothly. We were lucky to be flying on April 22nd during Earth Day and the day when 175 dedicated World Leaders signed the Paris Climate Agreement at the United Nations Headquarters in New York. Bertrand Piccard had a conversation with the UN Secretary General Ban Ki-moon live from the cockpit in front of all 175 Heads of States. Finally, with clear blue skies and calm winds, it was the perfect flight to show that clean technologies can improve quality of life. Bertrand ended the flight with an epic flyover of the Golden Gate Bridge and the city of San Francisco. A poetic ending. If you haven’t already - now is the time! Subscribe here to be notified when the next round-the-world flight will take place.